Perhaps the greatest reward of a long walk is how it turns what is usually random in life and what we can control around. Normally in modern life things like eating, sleeping and keeping out of bad weather are routine, whilst random events are imposed on us by others or by artificial (in the great and long term scheme of things) societal norms. (You know - jobs, parking tickets, events, taxes, emails). But walking especially in wintery weather reduces life to a simple and joyful response to an animal need for food, shelter and trotting on as if migrating to better weather. Everything else rather fades in importance. And the random things that happen whether good or bad are immediate and not deferred. Which brings me to breakfast as pictured. 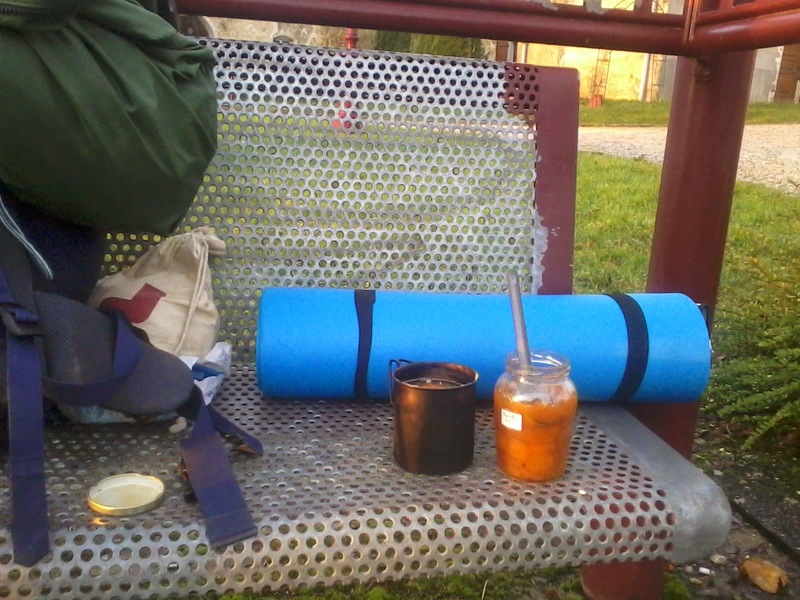 Barely past dawn, a bit chilly after a night in a barn but sheltered from the rain and here's breakfast laid out in a handy village bus shelter after a few hours walking. Look at that pot of homemade mirabelle jam. Lovely. And random. But very good random. The night before, Thurs 27, after a long slog across country through the day - beautiful, sunny, but winding and hilly - and then a busy road in the dark (bad random) I'd set off into the woods in search of a possible bridle path. I came to a dark, sprawling village. There was a flurry of barking and I was receiving the - um - attentions of a Border Terrier. 'Hiro! HIRO!' called a voice from the dark. 'Don't worry,' I called back in French 'my sister's got a Border - they're always excitable.' And so I met Catherine. Who invited me back to her house, an ancient Mill. She might have had some qualms when she saw me in the full glare of the hall lights. (It's the first house I've been in since starting from Munich three weeks ago). If so she hid it well, and produced coffee as I sat in a warm, comfortable kitchen. Her two small daughters - Julie and Marion - were enchanted, or at least fascinated, by this apparition from the dark. I felt a bit like the Gruffalo - shaggy, muddy, carrying the aura of the dark woods but on my best behaviour. It was charming. Catherine had been in Ireland when she was eight - she remembered sheep. And had an Irish tin whistle - I played a couple of quick tunes and was then outshone but enchanted in turn by one daughter playing on a traverse-flute, and singing. We looked up the website of a previous pedestrian she'd met as he'd passed through the village, though he had a big Corsican donkey to carry his gear and finally paced out some three thousand kms on a circuit of France. This gave me a chance to do some shameless self-promoting - bringing up this blog and pages for Paddle; a long way around Ireland and other writings. The effect was rather gratifying - it confirmed me as more in the tradition of the scholar-gypsy than feckless-vagrant. As I set off into the dark on a sand track over a bare, domed hill and onto the forest beyond, Catherine gave me the jar of home-made jam whilst Julie and Marion waved and chanted goodbyes, and Hiro rushed around in circles. And that night I spent as a feckless-vagrant, finding an open barn a little outside a tiny village. I slept on a bed of straw and was up at six to be away before discovery. There is something wonderful about being on the road before dawn and having the light grow around one and curling mists. The smell of wild boar, muntjac deer barking, buzzards the first birds to start calling and a big dog fox that I crept up on till it was only a stick's length away and then noticed me and did a hilarious double-take. All that and jam for breakfast. I changed my route yesterday - skipped Neufchateau and its pleasures and temptations to cut across country and save around ten miles (and all the time I'd have spent in cafes in town). Risk was not finding a shop before the weekend and being reduced to two days living on jam. But a supermarket appeared in an unlikely village and I stocked up. I could do with one of those Corsican donkeys - even travelling with minimal kit a few litres of water, warm layers and food enough for a few days - the 25-30 lbs/12 kilos I'm carrying is perhaps the biggest difference between Herzog walking and me. But the weight has allowed me to sleep out reasonably comfortably every night, rather than going to the extremes of either breaking into holiday homes or staying in hotels. My next problem with dark approaching was how to keep going. The direct road west was busy and verge trotting into the lights of speeding traffic is nerve wracking. But then inspiration - crossing the railway lines into town I'd noticed that there was grass and weeds growing between the tracks. A few enquires and indeed, yes, trains stopped running a few years ago when the valleys many factories turning the local mature forest into furniture nearly all closed down. Bad news for the locals, but my salvation. I trotted off down the tracks in the dark humming train songs. Breakfast like a king, lunch like a prince, supper like a pauper my elders often say the same and always consider it.I am very foody but i follow this advice strictly. Very good article.